Urdam Tours & Travels (Pvt) Ltd. -.- Discover the Facinating World's Wonders with us! Services extended and hotels offered both at Saudi Arabia and Dubai were of excellence par. We are one of the leading Tour Operators and Destination Management Company in Pakistan having more than 6 years of valuable experience in managing inbound & outbound tours. 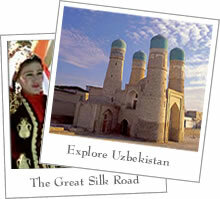 Uzbekistan, the most populous and arguably the most powerful state in Central Asia! 8 days 7 nights premium package. Discover 6 major historic cities. Includes all activities that a traveler can expect to make his tour memorable forever.